I have used this product in varied locations far and wide, from the desert in Nevada and Arizona, to the suburbs of Tennessee and many places in between. At times my Mobile 4G has made all the difference: the difference between being able to make a cell call or not; the difference between being able to load a web page, send an email or not. By bolstering signal strength it can also reduce dropped calls, prevent dropped Internet connections as well speed up Internet downloads and extend talk time by reducing battery drain. Surprisingly, there have been occasions where it has been advantageous to avoid using the booster–more on that later–but in those situations you wouldn’t need it anyway, in my experience. Some signal boosters work with one cell provider only, they are dedicated to either AT&T or Verizon, etc. The Wilson Mobile 4G works with most all if not all carriers. This is a consideration if you might wish to change carriers at some point. You wouldn’t want to find the booster you have useless with your new carrier. Some boosters may only boost 3G or 4G signals. The Mobile 4G boosts them all, including voice, 3G, 4G and LTE. Some boosters will only work with one device at a time. The Mobile 4G can work with multiple devices so it can be used by more than one person simultaneously. Some boosters won’t do that. I have an AT&T iPhone and a Verizon iPad. I wanted two different carriers for those times in my travels I might not be able to get reception with one or the other. That explains why I waited for the release of the Mobile 4G rather than purchasing a one-trick-pony. I’m not terribly technical so if you want to know more about the technical aspects of the device you can look at the WeBoost web site or elsewhere. What is important to me is if the mobile 4G works, and it does. The Mobile 4G has several components including a very solid feeling booster unit, indoor and outdoor antennas, and a power supply fitted with a cigarette lighter plug. The outdoor antenna sends and receives signals to and from cell towers. The indoor antenna sends and receives signals to and from your devices. The booster sits between the antennas doing its thing. It would be easiest if the indoor antenna could be located in one place as you move about freely in your RV, boat, whatever, but in actual use I have found that my iPad or iPhone really need to be very close to or in contact with the indoor antenna for the best results. This is a product I sometimes use and rely upon in order to make cell phone calls or use my iPhone or iPad for email or Internet. (My iPad can also act as a HotSpot and I have used it as such with my laptop). For certain people under certain circumstances I recommend seriously considering the Mobile 4G as an aid to both cellular phone conversations and data transfer. By data transfer I mean primarily using the Internet via cellular connectivity such as you would with smart phones, tablets, etc. when not using WiFi or hard wired to an Internet connection. There have been more than a few occasions where I have been in areas of fringe cellular reception and have not been able to make or receive cell calls; areas where loading a web page or sending an email or text message could not be done. In some of those situations firing up the Mobile 4G has allowed me to make calls, to surf the web, send and receive texts. At times this has been crucial to me and I can imagine there might be times where it could be life saving. I hope that is never the case for me or anybody else, but you know its going to happen somewhere for someone eventually. I mentioned above that there have been times that I’ve found using the Mobile 4G to be disadvantageous. In those situations I really didn’t need to use it because I had good enough cellular connectivity without it. The symptom that I’ve run into on occasion is that turning on the booster slowed down data download speeds somewhat. At the same time it usually boosted data upload speeds as well as boosting voice signal strength. Apart from empirical evidence such as seeing the number of bars increase on my iPhone and iPad when I turn on the booster I have at my disposal a couple of tools in the form of apps with which I can measure both signal strength and data transfer speeds. These tools are free and easy to use apps for mobile devices. SpeedTest will show you both data download and upload speeds in just a few seconds. It will also provide location data and keeps a log of the tests you make which can be exported for other purposes. It can be used with WiFi as well as cellular signals. For testing signal strength I use FieldTester. You won’t find it in Apple’s app store unless you search using two words: field tester. You can often quickly and easily see the difference turning on the booster makes. I qualified that statement saying “often” because sometimes in areas of fringe reception cell performance is erratic. One second your device is showing 3 bars and the next it shows No Service. One second it says LTE, the next you have no connection. When you’ve got cell connectivity that isn’t so bonkers it’s easier to get a read on how well the Mobile 4G is working for you, or not. I have found myself in many locations where measurements of voice and data signals varied erratically from one second to the next both with the booster and without, but typically when using the booster the signals are stronger. Installing the booster can be less or more of a job depending on how you want to do it. Installation is easy according Wilson and instructions are on the WeBoost web site. 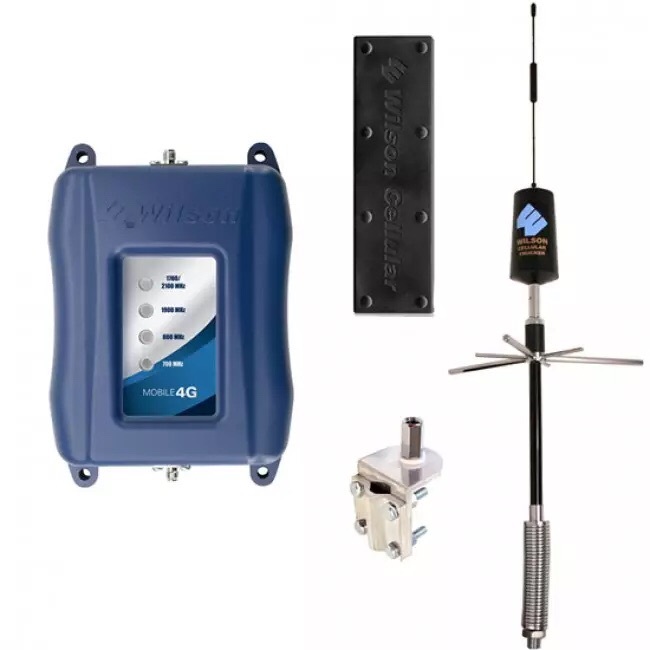 The WeBoost Drive 4G-M Cell Signal Booster (formerly the Wilson Mobile 4G) is worth considering if you feel the need for the kind of increased connectivity I have described. WeBoost now makes the RV 4G for RVs that allows repositioning of the outside antenna with a suction cup antenna holder so you can optimize the antenna location as you travel about in order to get the best results. As I wrote in my opening remarks it has at times made the difference between having connectivity and not. At the time I purchased mine it was the only multi-carrier, multi data band booster on the market of which I was aware and it may still be. If you do decide to purchase one of these boosters please use the links at the beginning of this paragraph. Thanks. If you want to see all the cell phone boosters available at Amazon, click here. ADDENDUM: I want to add a few words for people who have little or no understanding of the ways various mobile devices connect to the mysterious wireless world. This will be an aid to understanding the operation of a cell booster such as the Wilson Mobile 4G. Basically there are two discrete channels involved with smart cell phones: one for cell phone calls and one for data connectivity such as email, web sites and apps. This explains why some invoices from cellular providers such as Verizon, AT&T and Sprint, to name a few, have separate sections for Voice and Data. Voice shows how much time you spend talking on the phone with Aunt Sally, and Data shows how much data in megabytes or gigabytes has been transferred when you visit her blog or send her photos of the kids. Smart Phones have different modes of connecting in order to do the things they do. One is via cellular towers which broadcast and receive cell signals over significant distances (depending on how many obstructions may be present such as tall buildings, hilly terrain, etc.). You’re on a cell network when your phone is receiving and transmitting this way. WiFi is another means by which cell phones transfer data. WiFi works only over short distances. In populated areas with buildings and the like it may travel only 50′. With WiFi you can send email, use apps and surf the web. More recently, some cell phones started allowing phone calls over WiFi but that wasn’t always so. With WiFi you don’t connect to a cell tower, you connect to a router which may be hard wired to the Internet through a telephone line or a cable company. Routers can also connect to the Internet via satellite or cell towers, but when you are using WiFi you are connected to a router regardless of how the router gets its connection. Then there is Bluetooth. In my limited, lay understanding, Bluetooth is only for exchanging data over very short distances and like WiFi isn’t used for making cell calls. Does it have an AC power cord? I have a Sure Call booster and it has both AC and DC. No. This unit is made for mobile applications where 12v DC is generally more available than AC. It’s pretty typical that if somebody has AC available such as from shore power or a generator their RV will have a built in converter to convert it to DC. Do you see a circumstance under which including and AC option would add any functionality?